An old picture at our first booth event, the Live Green Toronto Festival 2011. 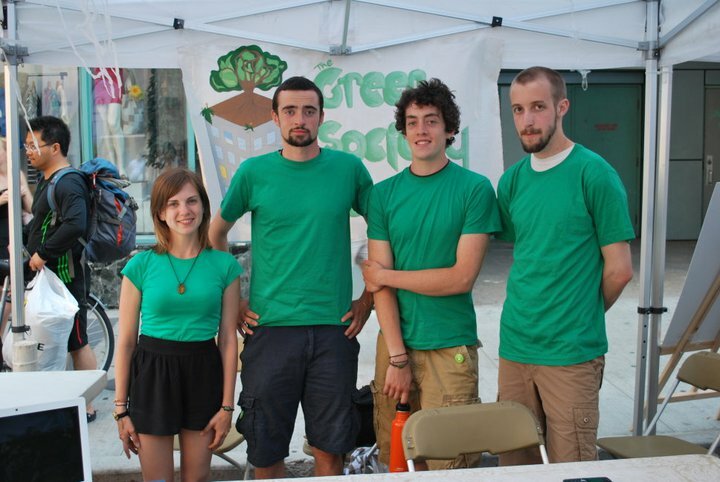 The Green Society Campaign is an environmental media production group, founded in November 2010. We endeavor to inspire the next wave of environmentalism through media savvy, accessibility and the honesty of our message. Our work towards this goal includes producing videos for environmental organizations as well as our own educational and creative content. In the past we have worked with Earth Day Canada’s EcoMentors, EcoChase and the Environmental Studies Association of Canada. We also directly engage the public through presentations and our concert series ‘Locally Grown’ which has raised money for local green initiatives including the Evergreen Brickworks and Harvest Noon. 1. Organizational Outreach: We support environmental organizations with videography work and video production, thereby increasing their scope and ability to foster change. 2. Web Outreach: We release videos that range from interviews with sustainable thinkers to educational videos and short satirical environmental news pieces. We also release blogs, which focus on environmental education, news and commentary. 3. Community Outreach: We directly relate to the public by giving presentations at local high schools on the concepts of sustainability and by throwing fundraising events for green non-profits in order to provide extra financial support and encourage our community to become more involved in environmental initiatives.